One of the most idiosyncratic and original sculptors of the High Renaissance, Severo da Ravenna worked between the courts of Padua, Ferrara and Ravenna, where he is first documented around 1496. 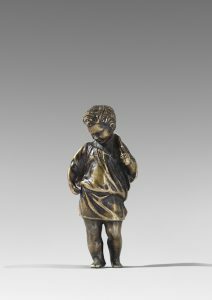 The present bronze, representing a pheasant boy or probably Tobias, relates to two examples known to have been produced by Severo’s workshop. 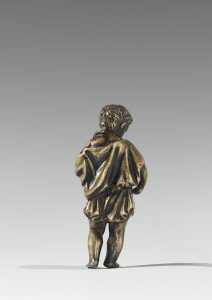 One, on an inkstand, is in the Bargello, Florence, whilst other casts of the single figure are in the Metropolitan Museum of Art, New York (inv. no. 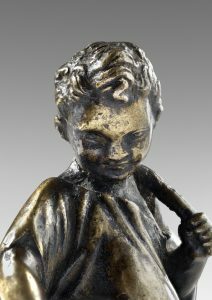 1982.60.94) and the Victoria & Albert Museum, London (inv. no. A.22-1960). 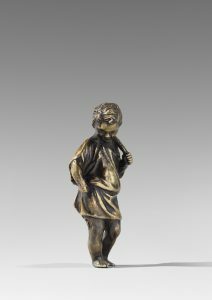 Both bronzes are distinguished by the supple modelling of the drapery and the absence of a base.